New in our offer. During Aerial Silks practice, you will perform various acrobatic elements in the air, with the help of special silk. The silk is rigged from the ceiling in two long tails, which arewrapped around the body during exercise. You will learn to climb, invert in the air, and hang upside down with the help of the silk, as well as various sequences, figures, flips, and elegant descents in the style of Cirque du Soleil. 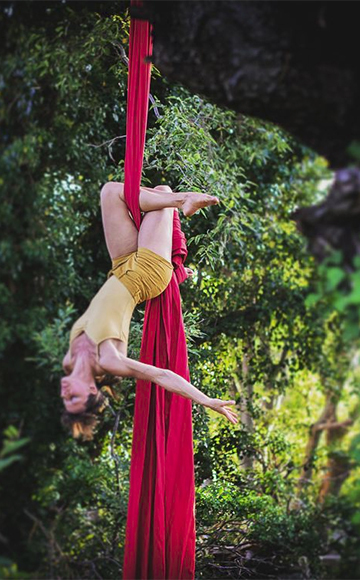 Aerial Silks is a workout for the whole body. Your arms and legs will get a workout, as well as abdominal and back muscles. The exercise will increase the flexibility of your body and improve your balance, while your movements will become graceful. Before exercising Aerial Silks, it is mandatory to visit Aerial Yoga, where you will master basic techniques and gain the power necessary to perform Aerial Silks. Aerialist Nives Soldičić, Vice-President of the Udruga za scenske umjetnosti Prostor Plus (Rijeka, Croatia), conducts the workshops. Arial Silks are carried out in the form of intensive workshops, organized several times a year. For information and registration, contact us via aerialyoga.mb@gmail.com.